Technique: You gave lectures on astronomy as a teen; how do those lectures compare to the one you are going to give at Tech tonight? 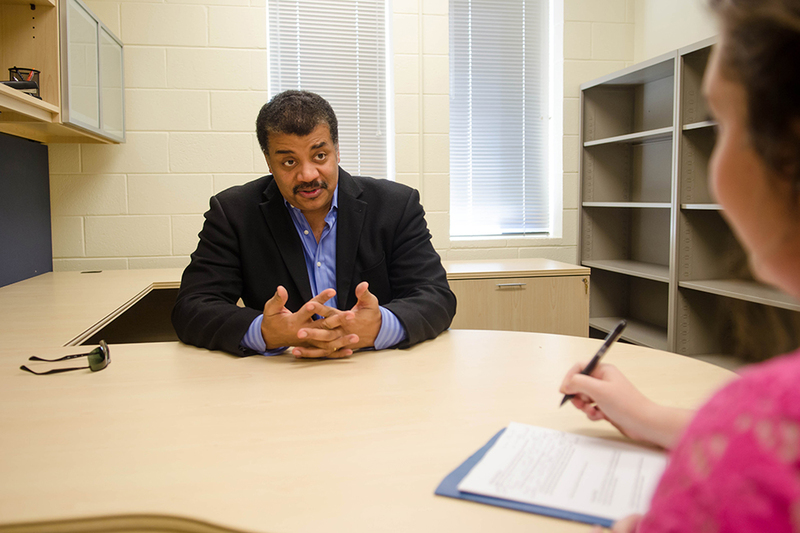 Tyson: My first lecture was when I was 15 and I was paid for that lecture, $50, I was 15 and it was 1973. Combine all those facts and it was a million dollars. I felt a like “why should I be paid for what I know?” I didn’t sweat to communicate this information. I just happened to know it and they didn’t at the time. Then I realized that’s just how the world works. That was an extraordinary moment for me…. So how did that compare to now? Well that group was smaller, a classroom. Maybe 40-50 people. What is the same, is that there is no end of fascination that people have with the cosmos. I could see it in their eyes at the time and I can see it in their eyes today. Technique: I read that the first time you tried to get a PhD, the committee voted to dissolve itself. At Tech, is pretty common to fail a class and then have to decide whether that major or career is right for you. What made you go back to astrophysics? Tyson: Oh, my interest was deeper than anyone could have imagined. I think they expected that I would just pick up some other profession; I think that’s what most people do when an official set of people tell you you can’t be what you’ve spent your life trying to become. But that was insufficient to stop me. They had no idea how deep my ambitions were. Technique: At Tech, we have majors like “Science, Technology and Culture,” which focus on the impact of discovery, rather than discovery itself. How do you think those majors compare to ones involving “harder” science? Tyson: If everyone did that then no one would be discovering, but someone needs to do it. Without it then we would have no context to know how and why to make the next discovery. Technique: Do you think classes that weed out students are detrimental to scientific discovery, or should science-based classes be difficult? Tyson: If you teach a class, any class, for the purpose of having people lose interest in that subject, then you need your head examined. [Laughs] You need all your heads examined. Learning should be the most fun thing we do in life. If someone interferes with it then swap them out. Technique: If you could do one thing to further STEM interest, what would it be? Tyson: I would make the Cosmos series. Let me think what that would be… I would host the Cosmos series. Technique: As a child, what was your favorite science fiction to read growing up? Tyson: I read mostly non-fiction and when it came to science fiction, I would wait for the movie to come out and watch the movie. I enjoy in my era growing up, there were a lot of apocalyptic stories, as there often are. People like to write that science will be the death of us all, not the life of us all. That’s a literary bias, even if it might make for a better story. I don’t know? But, I thought the most intriguing of the stories was the Planet of the Apes. Each of the species of apes played a different role in that society…. More thought was put into that than I appreciated as a kid. And of course, the film 2001: Space Odyssey was legendary in its impact of shaping our vision for what the future might be? Technique: Do you ever read the book? Tyson: Nope, I never. I wait for the movie. Technique: What about with Harry Potter? Tyson: Waited for the movie. It takes me less time to watch a movie than read a book and a view books as a way to get information, even if it’s storytelling. I’m not proud of that; there are many novels I should have read by now and haven’t. My daughter is 17 and has probably read five times as many novels as I have and I’m three times her age. I read for enjoyment, but I like for words to tell me how the world works. Technique: Do you watch The Big Bang Theory? After all, you were on it. Tyson: Yeah, yeah. I am irrationally drawn to it. I find myself reaching for the remote on Thursday night or whenever it comes on. Of course, it’s always on rerun. It runs a billion times a day. In fact, I get paid every time an episode airs, I think its like $12 but it’s a reminder they still show the show. Its enough to get an ice cream cone for two. Technique: How do you feel about being an Internet meme? Tyson: I don’t know. I don’t know why it’s a meme. I don’t know why it would catch on. I don’t know what the attraction is. I count that among the mysteries of the universe that remains out of reach of my intellect. Technique: If you could work with one scientist, dead or alive, who would it be? Tyson: Isaac Newton, by far. I think he was the smartest guy who ever lived. I would just look for the crumbs that would fall. They would be entire research careers for me, that’s how brilliant he was. I don’t know how good he was to work with, now that you mention it. Would be have made a good collaborator? I don’t know. But I would have him over for dinner, and I often think that if I were to bring someone from the past to the present, it would be Isaac Newton. So much of our civilization derives from his scientific creativity. His head would probably explode, by the way. He would see a car going down the street and wonder where are the horses? How does it move? What’s gasoline? He’d be a fast study of course, but it would be a reminder of what we have taken for granted.